wall Dance,Risa Tsunegi,2015.Mixed media,approx 170 × 120 × 17 cm. Risa Tsunegi’s work draws inspiration from the American Minimalist movement of the Sixties and Seventies and makes direct references to Post-abstract Expressionist aesthetics. Similarly to many Abstract Expressionist and Post-abstract Expressionist artists, her pieces display a rejection of the figure and focus on the physiology of shapes and forms. Her preoccupation with form, weight, and gravity and the sculpture’s experience as a mean to section architectural spaces somewhat recall of the works of the American sculptor Richard Serra. In contrast to Serra, though, much of Tsunegi’s work centralizes on surprise and deception. What you see is never what you get.Tsunegi is a master illusion maker. Her sculptural work Girder (2009), for example, showcasing some 500 cm long girder (steel construction beam) in a gravity defying composition, seems impossible – standing on a single edge, stretched upwards towards the ceiling with no support, tilted in space; it evokes the works of a magician. The heavy steel beam seems to be frozen in action, like a still from a movie documenting its fall. There is no visual clue how Tsunegi managed to suspend it in time and space. Not even a close inspection can reveal the entire sculpture is made of foam, meticulously shaped and finished to resemble steel, where the only edge that makes contact with the cement floor extends underground to support the awkward installation.Similarly fashioned is her piece Drips (2010), steel structure with paint drips. The pink paint drips dangle from the metal frame as if dried just before they dropped to the ground. Again, only scrupulous observation would reveal that what appears to be paint at first look is painstakingly sculpted sponge, fixed to the metal structure. Looking at Tsunegi’s work always inspires awe. When she’s not deceiving the viewer she cleverly divides spaces, often forcing the viewer to examine the surroundings in a specific predetermined method. It’s as if she takes pleasure in making the spectator experience the space the way she pre-resolved – performing for her, compelling the viewer to reconsider the architecture of the environs, paying attention to the structural details of the space. In dwam, Tsunegi’s exhibition at The Container, is a site-specific installation, a deliberation of the shape and size of the actual container that expertly combines both her interests as a sculptor – the renegotiation of spaces and the creation of illusions. The installation consists of two pieces Wall dance (2015), a large mixed media wall-like structure intervened by a column and Attachment (2015), a small sculpture suspended from the ceiling. Wall Dance (approx 170 x 120 x 17 cm) is a constructed tiled wall with a column piercing through its centre that extends from the ceiling of The Container. At first view the sculpture seems to stretch to the back wall of the space and appears to be made from plaster. 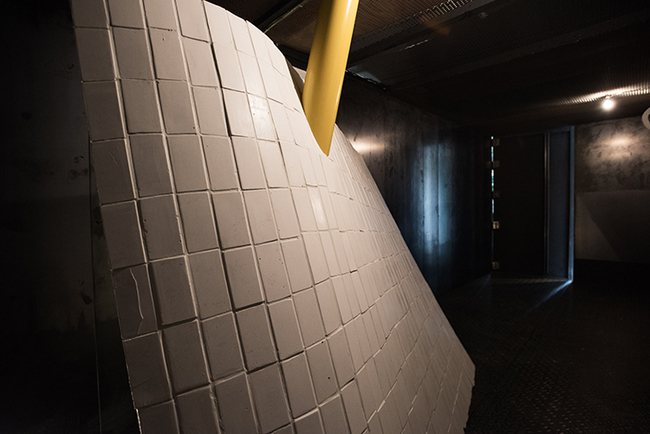 Closer inspection reveals the wall curves towards the back and invites the viewers to walk around it to reveal a foam construction that is covered with hand-made plaster tiles. It beautifully sections the space and the back of the structure, with its unfinished quality, stands in contrast to the carefully formed front view. What appears to be a solid and heavy construction reveals itself to be a light and fake structure – like a movie set assembled to create an allusion. Attachment (approx 25 x 5 x 120 cm) is a cast-like formation of cords extending from the ceiling to echo the pipes that are fixed on the cement wall that make up the permanent structure of The Container. This smaller piece is creating a dialogue with the larger sculptural work and reinforces the architecture of the exhibition space. Risa Tsunegi is a Japanese artist, born and raised in Gunma. She has received her Bachelor’s of Fine Arts from the Chelsea College of Art and Design in London, England and her Master of Fine Art from the Glasgow School of Art in Scotland. She is the recipient of the Glasgow Sculpture Studios MFA Graduate Fellowship supported by the Gordon Foundation and the Hope Scott Trust (2009), as well as awarded Creative and Professional Development Grant, Scottish Art Council (Arts Trust Scotland, 2010) and a grant from Creative Scotland in 2011. She currently resides in Tokyo.